We are affiliated with Amnesty International an international group working on human rights. Assyrian club welcomes anyone interested in getting to know more about the Assyrian culture, food, and costumes. We work together for philanthropic causes and try to connect to the Assyrian community! Bake for a Change is a club all about donating and giving back to our community. We have three events throughout the year where we bake, package, and sell sweets. With the proceeds from our bake sales we donate the money to our choice of charity! The Comics-Cartooning-Animation Club (CCA) meets periodically and conducts activities in the areas of comics, cartooning, and animation, such as learning and having discussions about the modern forms of visual art: meeting people who work in the areas of comics, cartooning, and animation to learn about their work: and creating comics, cartoons, and animation. (from the Preamble to our constitution). Our students develop, research and later perform chemistry demonstrations to the community and local jr. high school students. Junior Class Council is responsible for many of the Homecoming Festivities that everyone enjoys! We decorate the hallway for homecoming, decorate for the homecoming dance, and help plan events for the homecoming assembly. We also coordinate fundraising efforts that help pay for Prom and Senior Breakfast for our class, such as candy sales and car washes. Finally, we plan activities that students in the school can enjoy. This year we are planning to coordinate and Escape Room and Movie Night for students. Senior Class Council is a student-run organization that plans and promotes activities and events for the senior class at Maine East. Such events include Prom and Senior Breakfast. The club also runs fundraising events supporting the school-wide charity. The Demon guard adds visual elements to the Blue Regiment’s sound. We meet once a week, practice with the Blue Regiment, and perform during halftime at football games. Students meet to discuss current issues, plan for speakers and events, work on a service project (now developing a website for contacting community officials and locating service opportunities), and prepare to attend a statewide forum at ISU on the US role in a changing world. We help maintain our nature spaces on campus – the oak savanna near Dee entrance, butterfly garden outside science wing, and vegetable garden in center court. We have work days to maintain trails and remove invasive species, we plant and harvest food from our veggie garden, help raise awareness about our recycling program, and strive to improve our school’s green report card. French Club promotes the culture and traditions of French speaking countries. German Club is a social and cultural club to further the enrichment of the language and knowledge of new students taking German, students who have been in the program for years already, as well as for any new-comers. The club is open to anyone in the school. The club does fun activities, such as field trips, breakfasts, movies, decorations, and other after or before school activities. Students have fun while learning how to use graphic arts software (Adobe: PhotoShop, Illustrator, and InDesign) to create their own projects or projects for other Maine South clubs. Club members support Maine South departments, clubs, sports teams, and organizations by providing graphic design assistance whenever needed. Club members may be able to submit graphic design work to local and state competitions. Gymnastics Circus Club provides the opportunity for any boy or girl to learn gymnastics and Circus skills- no experience is necessary. Besides all the gymnastics apparatus, we have unicycles, stilts, and juggling equipment, along with Board Tumbling and Acromaniacs Vaulting for students to learn any skills they are interested in trying. 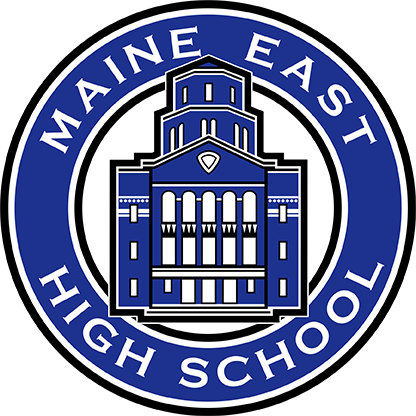 The goal of the club is to inform the students of Maine East of the career opportunities in the medical field and also to raise donations for worthy causes. Hellenic Club is for all students interested in celebrating Greek heritage and culture. We are a club that promotes awareness and appreciation of different cultures. Meet new people and chat with friends about the Italian language and culture. Language Learning and Exchange club (LLE) to provide students with opportunities to learn another language through conversation, communication, and tutoring from their peers and/or online resources. Maine Historical Society upholds the traditions of this organization that were started back in 1929. Everyone who is interested in learning about Islam and wants to help fight the battle of Islamophobia is welcome to attend. As a club we celebrate Polish traditional holidays, for example Wigilia, Andrzejki, etc. We conduct candy sales resulting in students receiving sweatshirts or t-shirts, we participate in the International Celebration, have pizza party, end of the year party, etc. R-Code is a PBIS organization that is dedicated to improving the culture and atmosphere at Maine East High School. R-Code’s focus is on teaching respectful, responsible, and ready behavior. We build robots using VEX parts and program them to complete challenges. We compete against other schools in these challenges in January. Scholastic Bowl is an academic quiz bowl competition. Students compete in teams of five to show their knowledge of literature, social science, math, science, fine arts, as well as popular culture and current events. This competitive activity is especially geared for students who are very knowledgable about the advanced high school curriculum, and can answer questions quickly with a buzzer/close out system. Maine East Scholastic Bowl has a full conference schedule in the CSL, and we also compete in about six Saturday tournaments. The season concludes with the IHSA state tournament, beginning with a regional competition in early March. The Science Fiction Club promotes the exposure to and enjoyment of various science fiction media to all Maine East students. Serbian Club celebrates the culture and history of Serbia. Spanish Club promotes the culture and traditions of Spanish speaking countries. Student Council gives students an opportunity to develop leadership skills by organizing and carrying out school activities and service projects. In addition to in club leadership activities the officers organize and run homecoming committees, V-Show ticket sales and advertising, blood drives and charity fund raisers. The Maine East Tech Genius Club has been providing students with opportunities to pursue a career in technology. Since 2013, weŐve connected our student members to valuable paid-internships, chances to network with established technology professionals, and provided student members with the funding necessary to work on exciting and distinctive tech-related projects. Join us to learn about how we engaged our members and helped them jumpstart their careers in technology. We do the building, lighting, sound, props, and costumes for all shows at Maine East. We run any and all events in the auditorium. As well as maintain the space and equipment.